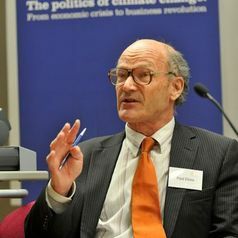 Paul Ekins is Professor of Resources and Environmental Policy at UCL, and Director of UCL's Institute for Sustainable Resources. He has been at UCL since 2009, following a similar position at King's College London. He was also Founder and Associate Director of the sustainable development charity Forum for the Future, and has been a specialist adviser to the Environmental Audit Committee of the House of Commons (1997-2005) and a Member of the Royal Commission on Environmental Pollution (2002-2008). He also has had extensive experience consulting for business, government and international organisations. In 1994 Paul Ekins received a Global 500 Award 'for outstanding environmental achievement' from the United Nations Environment Programme. Paul's academic work focuses on the conditions and policies for achieving an environmentally sustainable economy. He has made contributions in many areas relating to sustainable development and environmental policy, including energy and climate policy, and the modelling of the energy system; innovation and the low-carbon economy; the role of economic instruments such as environmental taxes and environmental tax reform; the conceptualisation and measurement of environmental sustainability, and sustainability assessment; the adjustment of the national accounts to take account of environmental impacts; and environment and trade. He is the author of numerous books, papers and articles on these issues, including Economic Growth and Environmental Sustainability: the Prospects for Green Growth (Routledge, London, 2000). Most recently, he is co-editor of the books Understanding the Costs of Environmental Regulation in Europe (Edward Elgar, Cheltenham, February 2009), Trade, Globalization, and Sustainability Impact Assessment: A Critical Look at Methods and Outcomes (Earthscan, London, April 2009) and Carbon-Energy Taxation: Lessons from Europe (Oxford University Press, Oxford, October 2009). Further edited books will appear in 2010: Hydrogen Energy: Economic and Social Challenges (Earthscan, London); Environmental Tax Reform: Resolving the Conflict Between Economic Growth and the Environment (Oxford University Press, Oxford); Energy 2050: the Transition to a Secure, Low-Carbon Energy System for the UK (Earthscan, London), and Green Fiscal Reform for the UK: Tackling Climate Change, Creating Jobs, (Earthscan, London).